There comes a point in every pre-Halloween horror movie marathon when you have to pause and stare at the screen in disbelief. It's not blood or gore or a particularly inventive monster that stops you in your tracks, but something far more sinister: You have to say, "Wait, is that who I think it is? What the hell is he doing here?!" Most actors do a handful of random roles before their careers take off -- and for some reason, the horror genre is an especially fertile marketplace. Each of the following people is very famous for something that in no way involves horror movies, and seeing them waltz across your screen with a chainsaw and a maniacal grin is mind-bogglingly random. Because even if they want to move on, they should know from horror movies that the past never stays buried. 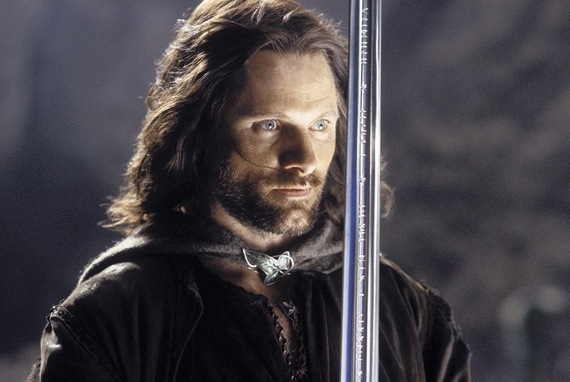 Viggo Mortensen is known for the iconic role of Aragorn. He's the King of Men, friend to hobbits, lover to elves, wearer of cloaks, wielder of swords. And just in case you weren't on the Lord of The Rings train, he also happens to be one of the best working actors today. His performance in Eastern Promises earned him a long-deserved Best Actor nomination, and it'll make you never want to encounter him in an alley. Or a sauna. Or a bar. But for all his chameleon acting talent, nobody remembers that time he was a character named Tex from Texas in Leatherface: Texas Chainsaw Massacre III, which is a shame. If you thought Aragorn was cool, just wait till you see Tex proudly holding a golden chainsaw bearing the inscription, "the Saw is Family." The Skeleton Key is a genuinely good suspense film seeped in Southern voodoo culture with a wicked shocker of an ending. But Kate Hudson's most iconic role is Penny Lane, the free-spirited groupie in Almost Famous. Her subsequent roles have been in films like How to Lose A Guy in 10 Days, Bride Wars, and Le Divorce. To tell you what kind of character she plays would be to spoil it, but just like Viggo Mortensen, it's a mixture of amusing and nice to see her step out of the box. No, he wasn't a Scream Queen like in the show you should be watching right now. He was in Halloween: The Curse of Michael Meyers. But considering the fact that Paul Rudd is America's nice guy -- he's handsome in a nonthreatening way and has a pleasant laugh and seems like he has a dog named Duke he walks three times a day -- seeing him waltz across your screen in the middle of one of the Halloween movies is enough to make you do a spit-take. "Life is like a box of crayons. Most people are the 8-color boxes, but what you're really looking for are the 64-color boxes with the sharpeners on the back. I fancy myself to be a 64-color box, though I've got a few missing. It's OK, though, because I've got some more vibrant colors like periwinkle at my disposal. I have a bit of a problem though in that I can only meet the 8-color boxes. Does anyone else have that problem? I mean there are so many different colors of life, of feeling, of articulation... so when I meet someone who's an 8-color type... I'm like, 'Hey girl, magenta!' and she's like, 'Oh, you mean purple!' and she goes off on her purple thing, and I'm like, 'No -- I want magenta!'" So of course he was a random truck driver with a handlebar mustache in the beginning of this zombie beaver movie even though he's not an actor, because why shouldn't he be? In a performance rivaling his painful turn in True Detective, Vaughn was Norman Bates in a bafflingly unnecessary shot-for-shot color remake of Psycho. The general public demanded this movie even less than they demanded [another Peter Pan origin story] (http://www.theatlantic.com/entertainment/archive/2015/10/pan-is-the-peter-pan-prequel-no-one-asked-for/409906/) and yet, like Pan, it happened anyway. As an extra bonus, Viggo Mortensen is also in this movie, making him the MVP of random horror roles. Why they didn't offer the more talented actor the role of Bates, the world may never know, but it probably worked out for the best for Viggo. And last but not least, when everyone was talking about the McConaissance, they forgot Phase 1: Matthew McConaughey's role in a Texas Chainsaw Massacre. If there's anything to be taken away from all this, it's that your Halloween movie marathons will bring you some excellently random surprises that aren't in the form of creepy crawlies -- and that Viggo Mortensen and Matthew McConaughey really need to team up for one last Texas Chainsaw Massacre movie. Possibly featuring a buddy-cop murderous road trip while they try to out-accent each other.